You need a gasket for your Omega case back? Well, open it up and take a look at it. Well, is it a Black O-Ring Rubber Gasket?` If so, then click order below and in the order comments section during the checkout tells us the Omega case number you found inside the case back after you opened the watch. We are no longer able to get more gaskets from Omega and will be supplying from stock until our supply runs out. We are not able to supply every gasket and will do our best to find your gasket. You need a gasket for your Omega case back? Well, open it up and take a look at it. Well, is it a Red Gasket?` If so, then click order below and in the order comments section during the checkout tells us the Omega case number you found inside the case back after you opened the watch. 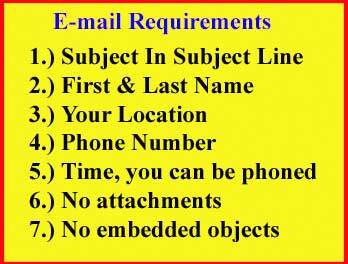 Once you click order and give us the case number we will either ship out from stock or get the correct gasket for you within 3-4 weeks. 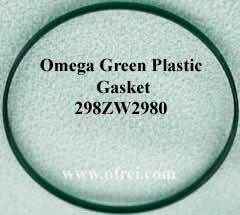 Most Omega Crystal gaskets are assigned the product code prefix number 098 in front of the rest of the part number listed in the Omega published Red Book of Case Numbers and Case Parts Numbers. All Omega crystal gaskets with the prefix code of 098 and 298 in front of the part number are $20.00 each. Click order below and in the order comments section during the checkout tells us the Omega case number you found inside the case back after you opened the watch. Once you click order and give us the case number we will either ship out from stock or get the correct gasket for you within 3-4 weeks. Price is for a single genuine crystal Omega gasket for above case numbers. Price is for a single genuine Omega gasket. Case numbers 176.015, 176.0015. This is an L Form Crystal Gasket 33.00 diameter 1.1 mm thick and 2.0 mm in height. Part number 098EG0074 is not listed in the red book for case numbers 176.016, 176.0016 the red case book shows 098-0071 as the bezel sleeve. However, it is reported to us that in the Omega Computer system it says the 098EG0074 to be the correct part 36 mm diameter, 0.62 mm by 1.1 mm high and that it replaces the no longer available 098-0071 listed in red book. Case numbers 176.016, 176.0016. This is an L Form Crystal Gasket 33.00 diameter 1.1 mm thick and 1.9 mm in height. To fit with Omega Sapphire Crystal 062SB3061. 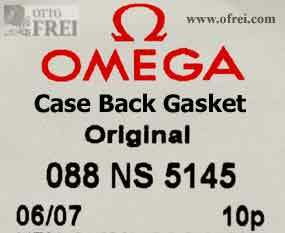 Price is for a single genuine Case Back Omega gasket for above case numbers. For case number 167.1310, 178.0223, 178.2071.